We have been trying out a few new places to eat in of late. 'New' to us and at times newly opened too. I realised that I don't end up writing about these on the blog as I get caught up with feature-like posts and wait for the right time to write about them till it becomes too late. 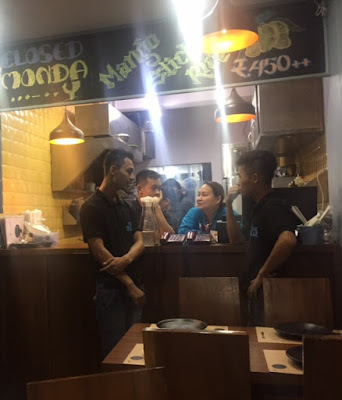 So what I am going to do from now is write short review-like posts on this based on our experiences at the restaurant and will cover the following aspects - ambiance, food - good and bad, service, price and verdict. These will be short and to the point and based on the dishes we have tried. These will not be based on meals which are hosted by restaurants/ hotels. I am calling this section Quick Bytes. Hope it helps. We went to The Blue Restaurant in Bandra's 16 Road for dinner on a day when our cook had bunked this week. I had wanted to visit the restaurant for a while as I had heard good things about the Thai food there on social media. From what I gather it is run by an expat chef couple who had earlier worked in San Qi Four Seasons, Mumbai. It was Tuesday night and we went there at 1030 pm without booking and got a table. It's a small place with an outdoor and an indoor section. We sat inside as it is air-conditioned there. The place is small and had a general fragrance of Asian cooking there which I liked. Possibly because it had an open kitchen. There are four tables and we were given one to sit at and the others were occupied. The place was fairly clean. The AC cooled it well despite the burners of the kitchen inside. Then they shut one of the two air conditioners around 11.15 pm when we were the only customers and were yet to finish our meal. I began perspiring like mad and requested them to switch it on which they did. In terms of ambiance it is far more simple than the Bastians and Mamagotos and Fatty Boys that do Asian food in Bandra. Possibly in deference to this, they do not charge for service. a. Crispy spicy pork: It is a part of dishes listed in the main course but we ordered it as a starter after the waiter assured us that it was a dry dish. It was indeed dry and not saucy and that worked for us. It is a stir fry that was served rather quickly to us making us wonder if they pork was half cooked earlier and kept prepped. The pork was crispy as promised and not chewy at all and seemed to be of good quality. The dominating taste was that of fresh Thai basil. It had chopped button mushrooms and baby corn in it which complimented the pork. Some of the mushroom was undercooked. It was not 'spicy' by Indian standards and even someone like me, who doesn't handle spice well, was fine with it. We both enjoyed the dish and K even Instagrammed (@spalifekainaz) herself with a piece of pork to show her approval! b. Pomfret steamed in lemon sauce: The dish contained a tiny whole pomfret which was bony as the waiter had earlier warned us it would be. The fish size is that of what you will get in Malvani joints such as Sadichcha and is done to keep the prices down. The flipside is that the bone to fish ratio is higher here than in a medium or bigger sized ones. 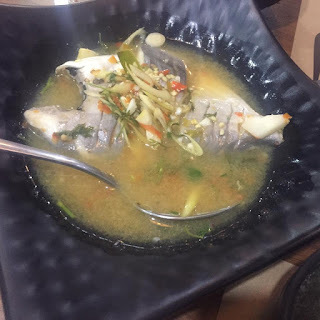 The fish was steamed brilliantly well and the meat was juicy and not over cooked. The tangy and spicy sauce in which it was cooked was pretty tantalising too and was packed with flavour. The chilli heat in it made me sweat a bit though I liked the dish and K was unfazed by the spice. 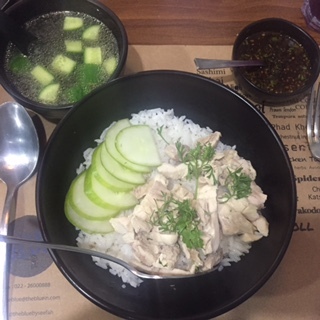 c. Hainanese chicken rice: I ordered this instead of a Thai curry as this is not as commonly available in Mumbai. The dish was a complete let down and I sent it back unfinished. The heart of the chicken rices that I have had in KL and in Singapore lies in the flavour of the rice which is cooked in chicken stock. The rice at The Blue was tasteless. The other alluring bit about a good chicken rice is the juiciness and the fattiness of the slow cooked chicken which extends to all parts of the chicken including the breast pieces. Here the chicken was chewy and tasteless again and made me yearn for the jeera chicken at Khane Khas next door. The broth served with it was good. 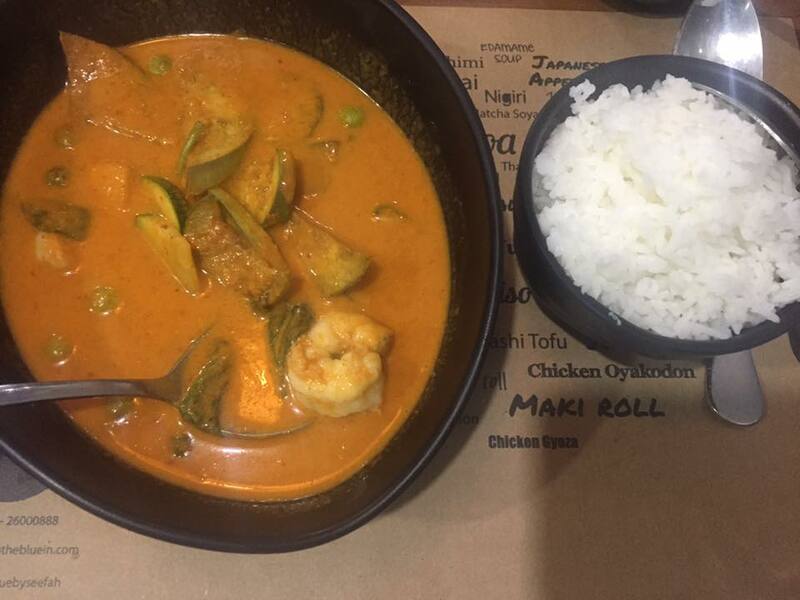 d. Thai red curry with extra prawns: I ordered a Thai red curry after the disastrous chicken rice. I ordered the red curry instead of green as not everyone in Mumbai gets it right and I find it to be the true test of an Asian place. The curry at The Blue lacked the richness and vibrancy of contrasting flavours that characterises a Thai curry as it lacked the chilli heat that one expects in it. Worse still, it left a strange metallic after taste in my mouth. I had a bit of the curry with the rice and then without rice. Neither worked so sent this back too. On the plus side, the prawns were not overcooked. It was hard to believe that the curry came from the same kitchen from which the steamed fish had come. e. We had a Thai pea-flower drink which was very sweet and a tad sour and synthetic. We jokingly referred to it as a Juhu beach Kala Khatta. Drinks and dessert in the far east can be a bit over the top and this was an example of that. If you like bold flavours and Juhu beach golas then this will work for you. We didn't have the sushi here which some people on social media have praised and can't comment on it. The service was competent. The staff answered whatever question I had while placing the order. The food brought to us promptly. As were empty bowls when we requested for them. I was gobsmacked when they switched off the AC before when we left. I also feel that two dishes being sent back largely unfinished should have led to someone coming and asking us what was wrong. Or maybe it was too late in the day and they were tired. Price: Rs 2,600 for 2 good dishes and 2 poor ones and for an ambiance which is very basic didn't seem like a good deal to us given other eating out options in Bandra. Verdict: The pork and pomfret dish are worth checking out for sure and show promise but given the inconsistency, it is better to take recommendations from people you know before you go there. We visited the restaurant anonymously, unannounced and paid for our meal.